Check with a qualified healthcare professional before using this product if you are under 18 years of age or if you have any known or suspected medical conditions and/or are taking any prescription or OTC medication. KEEP OUT OF REACH OF CHILDREN. Store in a cool, dry place. Read the saga about how Lyman Good is suing Gaspari, but Anavite tested clean! With Anavite back in vogue, check out the Anavite powder formula discussion on our blog! 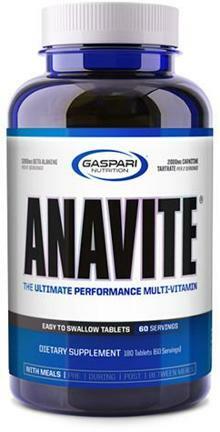 ANAVITE is far beyond a normal multivitamin. It's really 3 supplements in 1. An athlete's multivitamin/mineral formula with optimal, clinically validated doses of Beta-Alanine and Carnipure (L-Carnitine L-Tartrate) for promoting increased endurance and nitric oxide levels while optimizing recovery, thus supporting aerobic and anaerobic athletic performance. Fully loaded with highly bioavailable vitamin cofactors such as methylcobalamin and minerals such as methylselenocysteine you can expect that ANAVITE will exceed your expectations with this multivitamin & mineral formulation. * To raise the bar even further, Gaspari researchers included 2 FULL GRAMS of the powerful recovery aide Carnipure (L-Carnitine L-Tartrate) which has also been suggested to promote vasodilation, nitric oxide levels, and support increased androgen receptor density.